We can easily find the theme of World War One in plenty of art forms: film and novels are two obvious examples. The theme tells us a straight forward story (All Quiet on the Western Front). We will have a clear idea of what is being conveyed to us. But poetry is different. Things are not as clear cut and we are made to suspend our conception of reality and meaning when we engage with a poem. Or at least that is how a poem should work. Even the poetry of Owen, Sassoon, Rosenberg, etc., is not as straight forward as it may appear. Though we can assume that those great men were trying to convey the everyday living of war, we can never be certain. One could just as well see the war as a metaphor for the latest stage of capitalism at that time: Mass war; mass production. In the same manner that the worker became a part of the mechanics of the factory the soldiers became a part of the machinery of war. The words could have been written about the horrors that were the Second World War. Too many poets, since, seem intent on trying to capture an idea of ‘what it was like’. To a certain extent we can see that approach even in Andrew Motion’s The Five Acts of Harry Patch 'The Last Fighting Tommy'. So it is refreshing to come across this volume of poems from John Greening. None of the poems in this volume make any pretence in attempting to capture some sort of feeling of the war, as one critic put it: “These are not poems as history lessons.” There is no faux rage about the slaughter of so many men, instead Greening takes us on a journey through the century still recovering from the upheaval of that war. as if for a crime scene. on the hotel TV . . .
Greening realises that there is no need for dramatics to put across the feel of war; in this sense he displays a great deal of respect for his audience: allowing them to respond to his poetry in their own way and at their own time. In doing so he captures the humanity of the war poets, who, in their own way, also rejected hysteria in regards to their own work, and in many ways gave a feeling of ordinariness to their experience of the war (see my essay The Sound of Distant Drums). Edward Thomas is usually grouped alongside the War Poets, though that is disputable. Thomas wrote very little poetry about the war. For example in his poem This is no Case of Petty Right and Wrong, we feel a disgust and utter contempt for the war, but that poem seems to be a response to newspaper articles rather than any participation in the War. But he did fight and he died in the War in 1917. He did leave a diary of his experience. In his last entry there were a few lines, which may well have developed into a poem; one that could very well have been a War Poem, in the sense of Owen, Sassoon, Rosenberg, etc. Roads shining like river up hill after rain. You died at an observation post. The play on names such as Chaplin and Britten is a fine example of the care and humour that Greening puts into his work. As we near the end of the centenary of the start of World War One we wonder at what it all means to us today. There have been a good few publications and broadcasts on the War over the year. 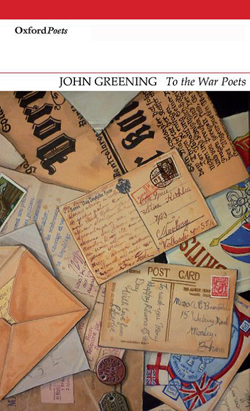 Although Greening’s collection was published on Armistice Day 2013, it had its place in 2014. Yet To The War Poets is not a collection of poems about World War One, but takes as its theme the decades after the war. It is a volume of contemporary poetry in the truest sense that I hope will be read in many years to come, alongside the works of the War Poets. Watch the video of Greening Greening on the speakers panel at the Manchester Salon discussion in October 2014 by clicking on this 'Writers and War' link.